For a limited time, CoolWatermark (unlimited developers license), will be offered for a special of only $595.5 for a limited time for this version! Click here to order now! 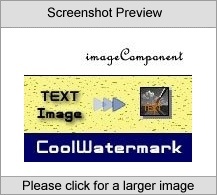 CoolWatermark is a cool and strong assembly to write watermark text or overlapped photo on image and is designed for .NET; you can easily use it in .NET window application or ASP.NET application. Read all Image types that .NET supports(Bmp, Emf, Exif, Gif, Icon, Jpeg, Png, Tif, Wmf ) . All methods return System.Drawing.Image object on which you can make any modification, so you can also operate the object easily with your application. Suuports to write text with kinds of special shapes and effects, with shadow and hollow; supports to traparent watermark, and specialize the default position of watermark. Also, supports to write overlapped image. Try the free trial version first, or click here for pricing/to purchase a full version! Order by phone, fax, cheque, money order, or order securely online!